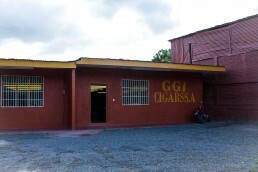 One of the world’s cigar capitals is a little town called Estelí, in the Northern Highlands of Nicaragua. Nicaraguan cigar factories spot this city where you can visit and buy some quality “tubes” to take home, too, if you like. Estelí became a kind of refuge to Cuban cigar makers during the Cuban revolution in 1959. The people brought with them the knowledge of growing the tobacco and making the cigars, and nowadays Estelí produces top-rated Nicaraguan cigars that are some of the world’s best ones. 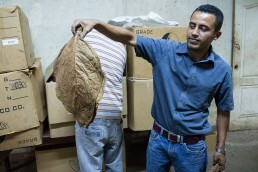 Nicaraguan cigars are great rivals to the Cuban ones, and some people even say that they are the best in the world. Unless you have a car, you have to take a bus to Estelí. There are quite good and frequent connections to Estelí from many cities, but of course, some of the coaches are Ruteados (aka chicken buses), and they are not particularly comfortable transportation mode. We took a minibus from León, which took about 2,5 hours. Minibusses are practically minivans with 12-15 seats, so they are much more comfortable than Ruteados and usually faster, too. Wondering about a great itinerary to Nicaragua which includes Estelí? Then look no further and check out our ultimate 4-week Nicaragua itinerary that includes all the highlights of this beautiful country! And pick out some of the best hotels to stay on your tour around Nicaragua from here! Or you can check other accommodations from here. 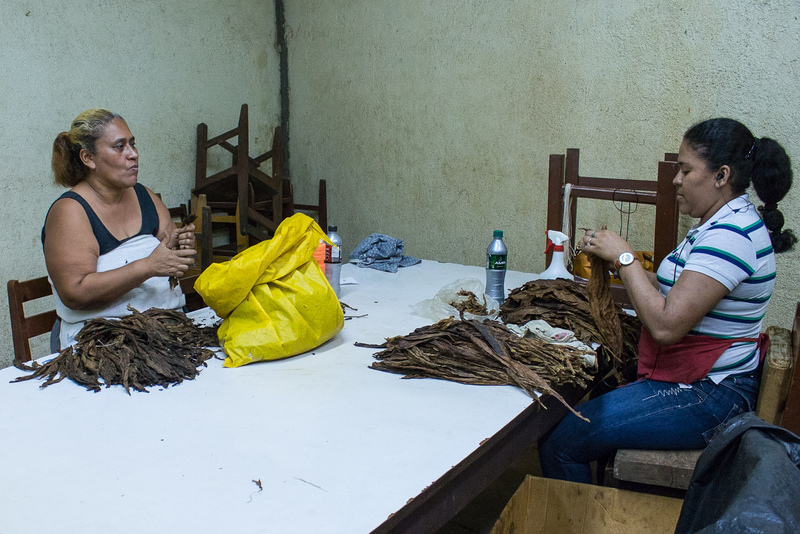 Visiting a Nicaraguan cigar factory is one of the “must” things to do when you’re in Estelí. Even if you don’t smoke, the experience is exciting. On a cigar tour, you can see how the cigars are made, from picking the right leaves for particular cigars to packing them for export. 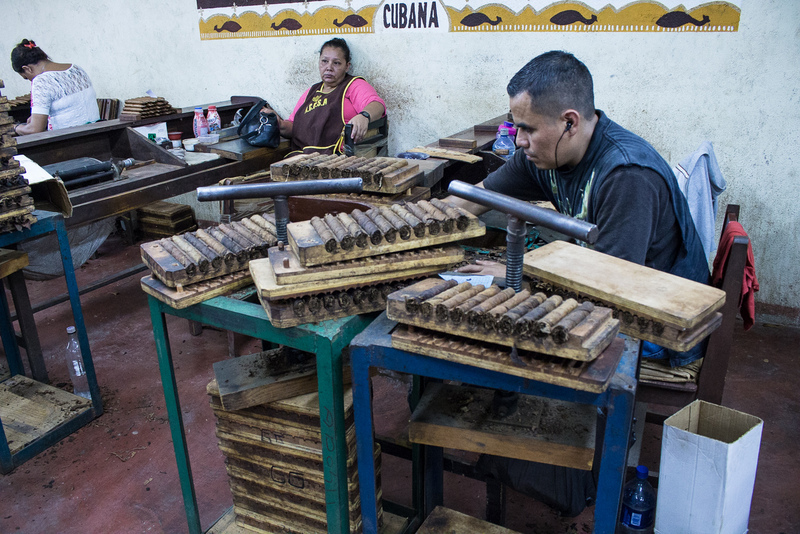 All of the cigars are handmade from start to finish, and you can’t but admire the craftsmanship of the workers who are rolling the cigars at maximum speed. Your guide will tell you detailed information about the cigars and the making process while you can watch a factory at work from close range. 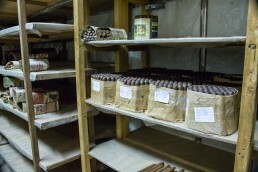 We visited a smaller facility, which was near our accommodation and which produced “only” 5000 cigars/day. This factory was also one of the most traditional ones still left in the area of Estelí. 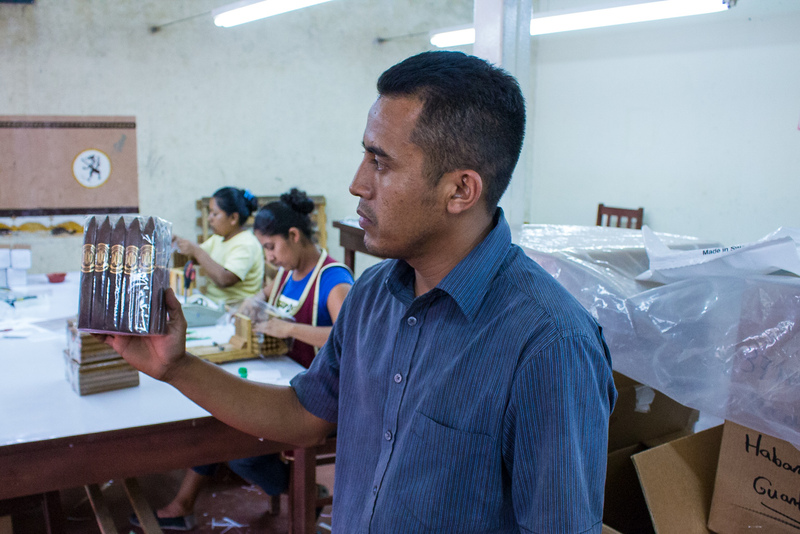 There are also more significant Nicaraguan cigar factories, which produce as much as 10000-15000 cigars/day, but in these factories, the making processes are more industrialized. 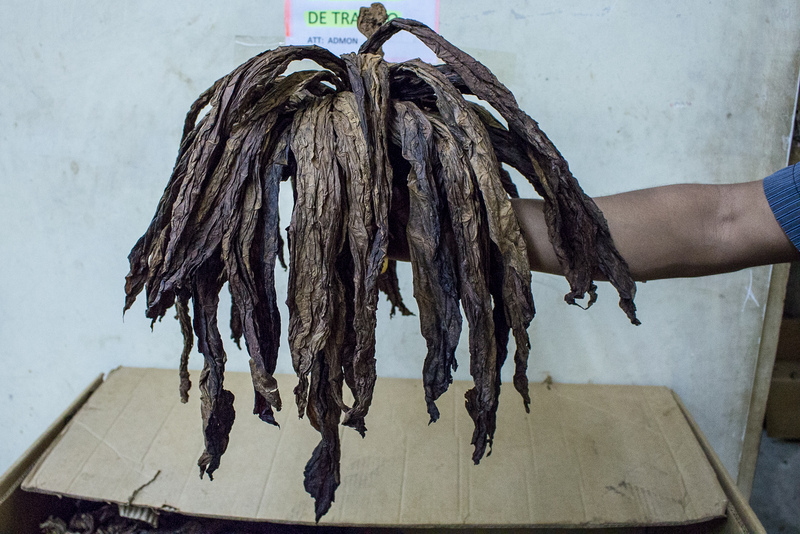 The price of a Nicaraguan cigar tour varies. There are many places from where you can book a cigar tour, for example from the Treehuggers (a hostel and a tour organizer in town), but almost any hotel or a Bed & Breakfast can book you one. We paid 6 USD/pp and booked through our B&B Villa Riviera, which got us a private tour for just the two of us with an excellent Spanish speaking guide, called Darwin. Besides booking a tour on the spot from the local providers and B&B’s, you can also book a tour to a Nicaraguan cigar factory from here. This will be convenient, especially if you are short on time. And you can pick up some cigar tour tips from here. 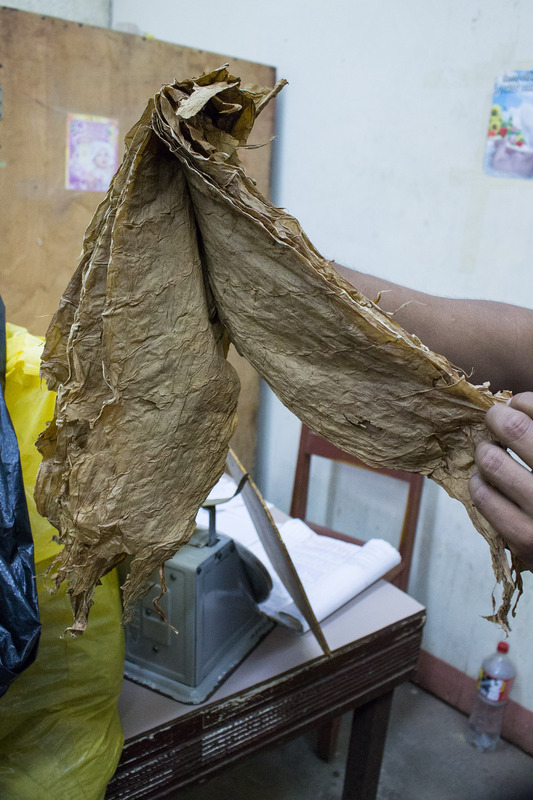 Only the darker tobacco leaves grow in Nicaragua. The stronger tasting cigars are made of these particular leaves. The milder tasting cigar leaves grow, for example, in Ecuador. The lighter leaves cannot be grown in Nicaragua because the climate is too cold. The real taste of a cigar depends on the climate in which the leaves are raised, and the leaves also differ in their thickness, color, and smell. So, there are many different choices of combinations to make different shaped, sized, and tasting cigars. Even if you’re not an expert, you can smell the difference between the different leaves your guide will give you to try out. 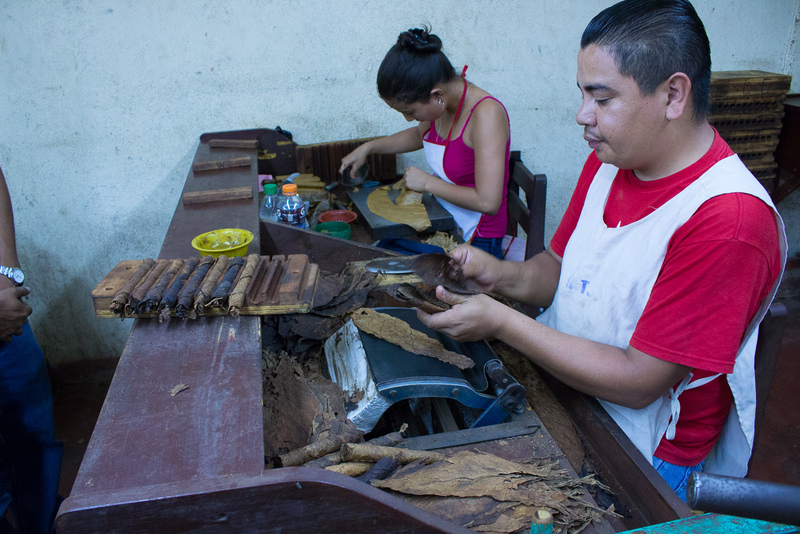 In the Nicaraguan cigar factories, the cigars have their name after their shape. Like one shaped like a rocket is called “torpedo.” The GGI cigar factory where we visited makes many different kinds of cigars. A significant portion of their production goes to export, primarily to Connecticut, United States. They also have an exclusive patent for one particularly unique shaped cigar, meaning no other factory can produce the same shaped cigar. The employees work in female/male teams of two. The man makes the first phase, and the woman does the finalizing. From the picture on the left below you can guess why. 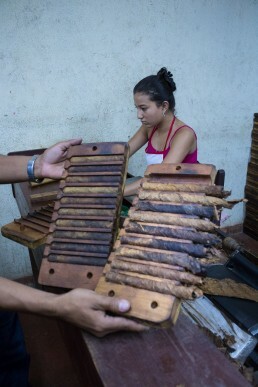 Then the cigars are put into the pressing mold. In the next phase, there is a real professional who rolls some more leaves into them (check the video from rolling Nicaraguan cigars here or from below ) and makes the final, delicate cuts. The employees have strict rules during working hours. They’re not even allowed to talk to each other. There was a sign on the wall which said that talking is allowed only on breakfast and lunchtime. Also though they’re not allowed to talk, they are authorized to smoke some cigars when working. The working hours are from 7 am to 5.30 pm. All workers have a target amount of cigars made in a day. If you don’t meet that goal, I believe you’ll quickly be out of a job. 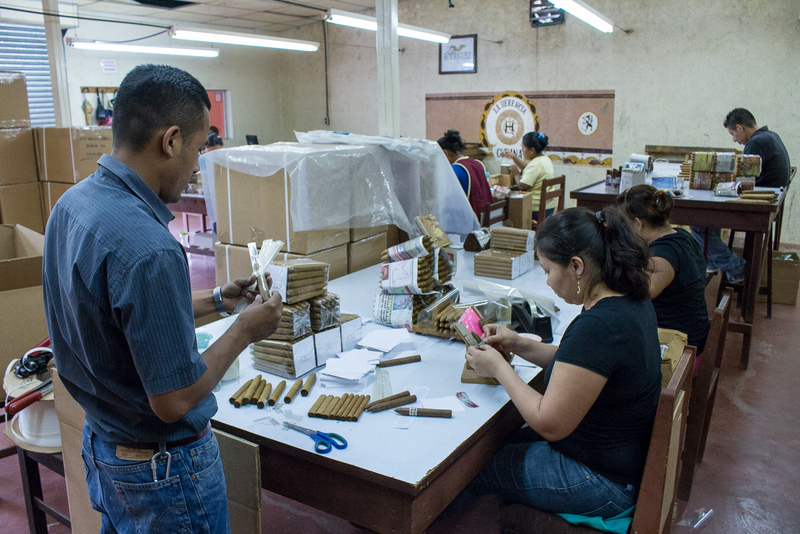 So, in Nicaragua, cigars factories have a pretty strict discipline but the end products are of perfect quality. All the finished products are then stored in cooling rooms for three months before they are sold, hand packed, and exported out of the factory. In the cooling chambers, there was every shaped, sized, colored, and tasting cigar you could imagine – shelves after shelves. Those rooms would have been a paradise for any cigar enthusiast, for sure. 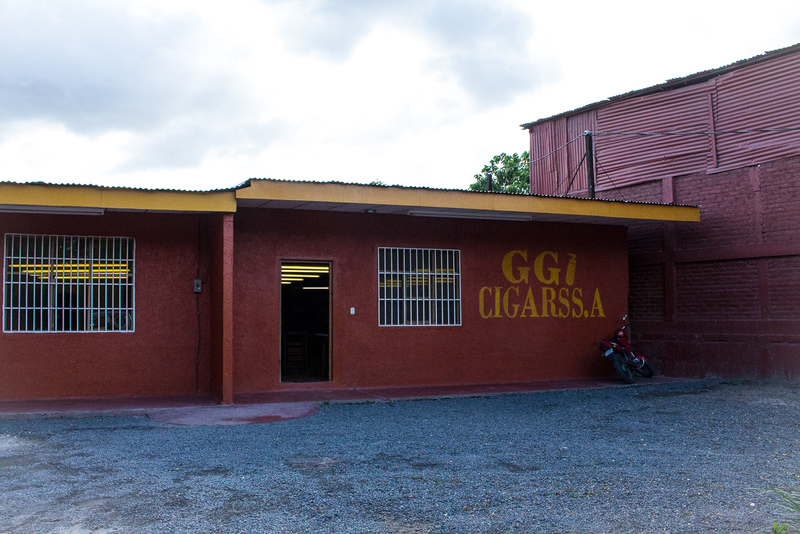 From many of the Nicaraguan cigar factories, you can also buy cigars to take home. From the GGI cigar factory where we visited, you could buy any amount you wanted. You can even buy just one piece of every different cigar you want, no need to purchase large packages. Having this option is very convenient because it’s possible to buy many different kinds of cigars for tasting. You can read more from our buyer’s guide to Nicaraguan cigar factory! The best thing is that the prices are meager compared to what they’re even in the local shops. When you buy directly from the factory, the average price is usually 1 USD/cigar, or 2-3 USD/cigar for the more unusual and rare ones. If you buy the same cigars from the United States, for example, they usually cost about 10 USD/cigar (or more). And if you buy them from Finland, the price would be even higher (about 12 EUR/cigar and up). So Estelí is the place to buy all those smokable souvenirs for your friends and family who love quality cigars! But when you get home, don’t forget to store your world’s best cigars in a good humidor so that they will conserve their impeccable tastes. And while you are in Nicaragua, cigar factory is probably one of those “must” places to visit. I promise that it will be an enthralling experience. If you’re visiting a smaller factory it may be that your guide is speaking only Spanish, so even beginner-level Spanish skills are required. Our Spanish is indeed not good, but we managed to enjoy the tour greatly, so don’t worry too much. BONUS: CHECK OUT OUR EXCLUSIVE CIGAR BUYING GUIDE HERE! *This post contains affiliate links. If you choose to use them, there won’t be any extra costs for you, but we may receive a small commission and you will help us to maintain this blog and bring you more awesome tips, tricks, and stories. Thank you so much! 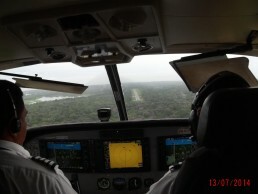 We are on our way to Nicaragua and we also are looking to visit a LOCAL cigar factory. We would like to visit the CGI as you mentioned above. 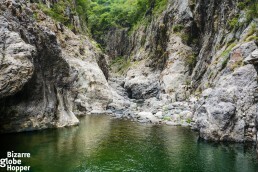 Would you be able to send me a bit more information on how to find this place once we arrive in Esteli? You gave us a good tour of this cigar factory. And it’s a great news that it’s still present in today’s new generation. Yes, there are still a lot of people who appreciate cigar making and seeing how it is made can definitely bring excitement to everyone especially to those cigar enthusiast. Thanks, glad you liked the post! Yeah, a tour in an “old-fashioned” cigar factory would definitely be a great experience for every cigar enthusiast. I’d warmly recommend it, it was so fun and interesting. Thanks for the info, guys! I’ll be traveling to Esteli in mid January 2016 to specifically tour Cigars de Nicaragua (also coffee and chocolate) and so your post is very informative. A question: is it possible to just show up at a cigar factory and get an informal tour (and buy product)? I’m a cigar enthusiast and there are quite a few factories I’d like to visit. Thanks in advance for your reply. Hi, Ross, and thanks for your comment. Glad to know that you found our post helpful. The factory we visited was a small one, though our B&B host called in advance and arranged the tour (on the same day, but anyway). So, I’d say that it’d be better to arrange your tours beforehand, at least call in advance on the same day. And I think that the bigger factories would require a pre-booked tour. It _could be possible just to show up, too, but you can’t be sure would you be able to take a tour then. So, it’d be a safer bet to arrange them beforehand. We hope that you’ll have a great time in Nicaragua! We loved it, it’s such a beautiful country! 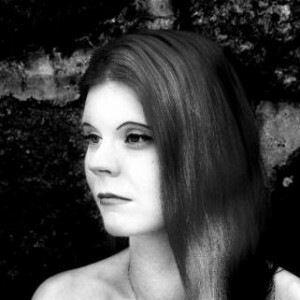 Excellent article and pictures! Inspires me to travel to Esteli! Thank you! and thank you! I’m glad to know that you liked the post. I hope you will be able to visit Estelí, and do then come back to tell us how was it! I read your article. The tour seems to be very nice :)! Do you remember the name of the B$B or the company where you booed the tour? I read your text and it sounds really nice. Me and my friend would like to go to the same factory. Do you remeber the name of the B&B or company where you booked the tour? and thanks for your mail. We are always happy to help when we can! Sure I remember, we stayed in the Bed&Breakfast Villa Riviera while in Estelí and its owner, Esther, booked us the tour to the CGI. I also sent you an email with their more detailed contact information. It was a nice tour just because the factory was so small. Hope you’ll have a great time! I mean, it’s not a tour that I’d personally choose, but it’s interesting all the same! Interesting tour to take! Did you feel like the workers were treated harshly at all? Seems kind of rough not to be able to talk during work hours. yeah, it was very interesting, even if you don’t really smoke (like us). Actually no, we didn’t feel like that the workers would’ve been treated harshly in any particular way. Though the rules which they have to obey during the working hours were very strict. But of course, if you think about rules like that from our point of view and compare them to our working culture, they do seem harsh. Have you visited Nicaragua, by the way?